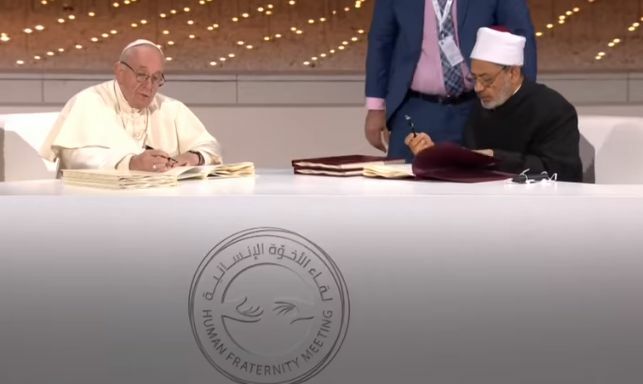 Pope Francis signed a ‘Peace document’, were the word “God” is used simultaneously to identify Allah and the God of Christianity, but makes no reference any time to Jesus Christ (the only way to the Father, John 14:6) or the Bible. This is not surprising since for him the meaning of being a Christian isn’t to belong to Christ, but to belong to the ‘Mother Church’, that is the Catholic Church: “Believing” is an ecclesial act. The Church’s faith precedes, engenders, supports and nourishes our faith. The Church is the mother of all believers. “No one can have God as Father who does not have the Church as Mother” Catechism of the Catholic Church #181. That’s his gospel, to call people to Catholicism or Mother Church, NOT to Christ. Please also check video, were he says having a direct, personal relationship with Jesus is dangerous & harmful! If Jesus is the Author & Finisher of our faith Heb.12:2 , the Beginning & End, the Alpha & Omega (Rev.1:8), the only way to the Father & heaven (Jn.14:6), then we really need to know who is Jesus if we don’t want to fall into the deception of false religions or cults. Most pseudo-Christian sects & some denominations are based in misunderstandings of the Old Testament. In the New Testament we found the revelation of many things that were just shadows of Christ or a mystery in the Old Testament. People can find salvation & the simplicity of Christ by reading the New Testament alone, but that won’t happen by reading the Old Testament by itself. Reformed/Calvinist theologians & Catholics teach the church replaces ‘Israel‘ (Replacement Theology), but that’s NOT what the New Testament teaches, please check in that link the 73 times the word ‘Israel’ is used int he NT. Also with some variations the Church of God & many of their splinters like Israelite Church of God (a.k.a Black Hebrew Israelites) & Hebrew Roots movement, teach another replacement theology as well, & it’s that Christians are or become ‘Israelites’. The but answering [He] said, not I was sent, if not to the sheep – being lost of [the] house [of] Israel. (check here or here). Recall back in the post, Snake on the pole, we talked about how the people of Israel worshiped the serpent that Moses made? The snake was destroyed by king Hezekiah (2 Kings 18:3-4) but unfortunately it didn’t end there, and the worship to the snake still continues to this very day? The word Antichrist means = One who opposes Christ, or who puts himself in the place of Christ, a false Christ. 1 / A spirit – That operates in false believers, heretics, etc. who oppose Jesus Christ Divinity, His teachings, etc. (1 John 2: 22-23, 2 Jn.1:7) and of these kind there are many in the world. But also there are some men who usurp Christ’s place and who call themselves saviors, messiahs, etc. So they operate under the influence of this spirit of antichrist. 2 / A man – The bible also speaks of a particular man coming, the man of sin, the son of perdition, that by Satan’s works at the end of times, will make great signs and that will oppose Jesus Christ teachings and put himself in Christ’s place, deceiving many.